The temple of Vrajvani in Bhachau Taluk is not on the main tourist map of Kuchchh. Mr. Bachhan is still to set foot here. But it is quiet a legend and a very revered shrine amongst the locals. We got the reference by chance from one of the teachers at the school where we are volunteering. 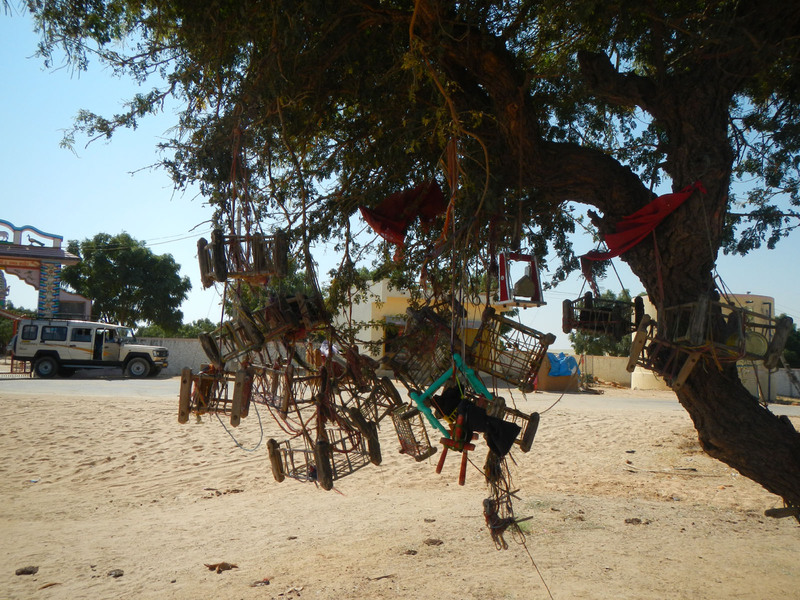 The entrance has a tree with miniature cradles tied on it as a wish for offspring. But this is not why Vrajvani is famous for. Legend has it that during a Janmansthanmi celebration few hundred years ago, an Ahir man took to play the dhol and the Ahir women, some 140 of them, started dancing on the rhythm. This performance went on and on, with neither the dholi giving up nor the dancers. It was like they were recreating the Raasleela of Krishna and Gopis. It is said that the women kept dancing on the beats for days or even a week. This angered the men of the Ahir community especially the husbands who came over to ask them to stop and get back home. After few futile attempts, the anger turned to rage and one of the men beheaded the dholi. This itself is quiet a dramatic story but what follows next actually stuns you. Following the death of their musician, the 140 women cremated themselves on his pyre. This wasn’t exactly sati as he wasn’t their husband, but the temple treats them as satis. 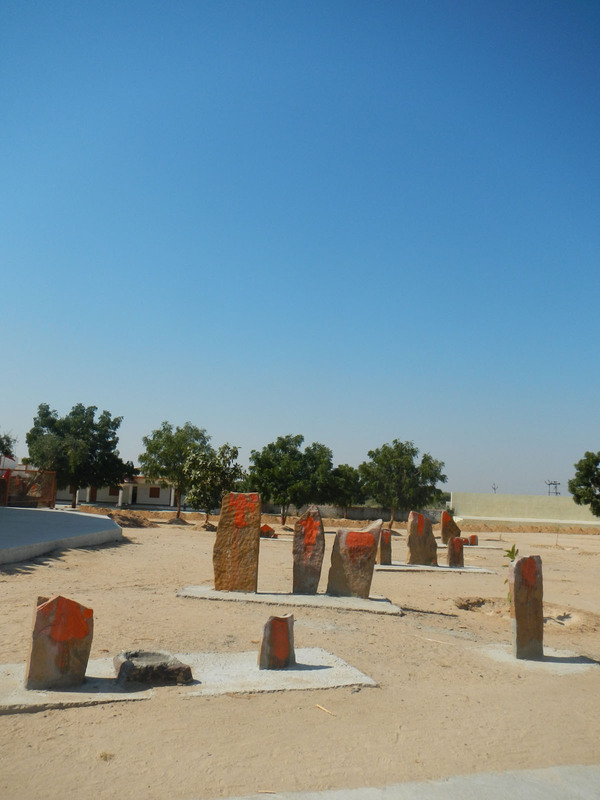 The temple compound has 140 big and small stone slabs marking their positions. 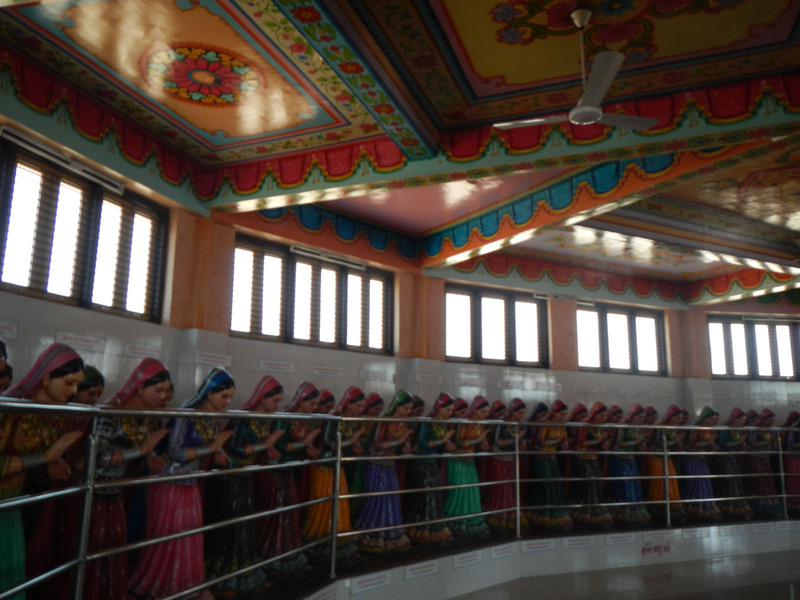 The temple itself has 140 life size statues of Ahir women bowing to Lord Krishna at the sanctum. It is lore and is not without exaggeration. But for me, the story goes beyond the dramatic end. I, in no way, support sati but I want to muse here a bit on the sentiment. What would have gone through the minds of those women to end their lives for someone who wasn’t related to them? They performed an extreme rite reserved for one’s husband. Was the bond of beats and dance over the period of a week, stronger than even matrimony? Is that what we refer to as trance of Gopis when Krishna played? Have those women achieved Nirvana so that there was nothing more to live for once the beats stopped? These are hypothetical questions based on lore. But walking around the sanctum and looking at the faces of those statues, you can almost discern the movements on beats. Be On The Road | Live your Travel Dream!
. Informed . Opinions .